The Manual Training School Meeting & Small Conference Centre is a spacious community facility ideal groups wanting to hold meetings, workshops, small conferences, corporate retreats, or informational, educational or cultural programs. The centre is a City of Cranbrook facility managed by the Library, connected to the Library and located next to a residential neighbourhood. It is available for rental every day of the week from 6 am to 10 pm. Due to its location, the room is not available for entertainment events, parties or recreational activities, other than those organised by the Library or City. People looking for a space to hold these kinds of activities can contact the City of Cranbrook’s Leisure Services or the Cranbrook and District Chamber of Commerce. Rates are subject to change without notice. In event of a discrepancy between the rates listed on this website and the rental agreement, the amounts on the rental agreement will be applied. Host your next event comfortably and affordably, with all the amenities to make it memorable in one of Cranbrook’s finest historic buildings. To book the Manual Training School, check availability here and review the rental details below, then contact the Library at 250 426 4063 to make the booking. 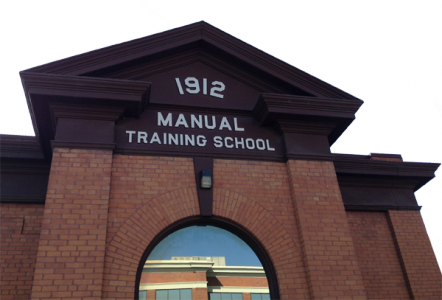 These are the regulations, terms and conditions for renting the Manual Training School as stated in the rental agreement. Cancellation by the booking party must be made 48 hours in advance of the event. The room must be left in the condition it was found. The booking party must make arrangements prior to the event if the room is to be used when the Library is closed. Supplies such as paper for flip charts, felt markers, pens, pencils, writing paper must be supplied by the renter. Library or City supplies are not available. The Library and City accept no responsibility or liability for equipment brought to or left on the premises. All publicity of the event is the responsibility of the booking party. The Library’s logo may not be used without the express written consent of the Chief Librarian or Deputy Librarian. The renter is responsible for picking up and returning equipment rented from the Library. The renter is responsible for any licenses and fees required by third parties. This includes, but is not limited to, special events permits, liquor licenses, food serving licenses. To waive any and all claims that I/we have or may have in the future against the City of Cranbrook and the Cranbrook Public Library and its elected officials including Mayor and Council, directors, officers, employees and representatives (all of whom are collectively referred to as “the Releasees”). To release the Releasees from any and all liability for any loss, damage, injury or expense that I/we may suffer, or that my next of kin may suffer as a result of my/our use or my/our presence on the facilities due to any cause whatsoever, including negligence, breach of contract, or breach of any statutory or other duty of care, including any duty of care owed under the Occupier’s Liability Act of British Columbia, RS Chap. 30, 1979, on the part of the Releasees. To hold harmless and protect the Releasees from any and all liability for any damages to property of, or personal injury to, and third party resulting from my/our use of the facilities. This agreement shall be effective and binding upon my/our heirs, next of kin, executors, administrators, assignees and representatives in the event of my/our death or incapacity. It is the sole responsibility of the Applicant to determine what additional insurance coverages, if any, are necessary and advisable for its own protection and/or to fulfill its obligations under this contract. Any such additional insurance shall be maintained and provided at the sole expense of the Applicant. The Applicant warrants and represents that if he/she executes this Application on behalf of a Group or Organization that the Applicant has sufficient power, authority and capacity to bind the Group or Organization with his/her signature. The Applicant, in consideration of being granted permission to use the facilities agrees to be bound by the Terms and Regulations and if the Applicant represents a Group or Organization, the Applicant agrees to inform all responsible officials associated with the Group or Organization of the Terms and Regulations and Waiver and Indemnity Clause.